Are you sick of the gray, sunless days of winter? Me too. I thought I would start a series of posts where I'll be searching for color. And since it is February, why not start with red? Here you see the fruits, or in more specific botanical terms, the pomes, of a hawthorn tree. Hawthorns are shrubs and scrubby trees with a nasty reputation for being terribly hard to identify. In fact, there really is no agreement as to just how many hawthorn species even exist. M.L. Fernald sums up the situation in Gray's 8th manual of botany by simply stating the genus is "of great taxonomic difficulty". I'm guessing that the tree pictured here was planted at our environmental education facility on the campus of ODNR. This specimen really adds a nice touch of color to a gray day. The fruits seem to be dwindling as the winter proceeds. Although I have not seen birds eat its fruits, this tree is a favorite perch of our year round population of mockingbirds. 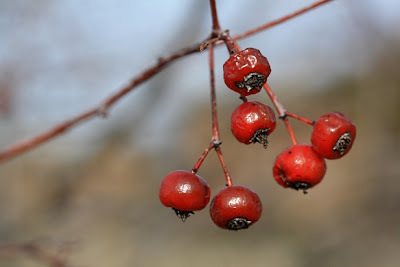 So look for hawthorn fruits on your winter ramblings, they can really brighten up the day. And be sure to check back for tomorrow's valentine colored plant, the red-osier dogwood. amazing colors and so surprised that the birdies have not picked those off yet! Can't wait to see tomorrows pictures! I'm sick of the gray!!! I love the idea of looking for color, good reds today! Happy Valentine's Day! Beautiful red berries with a gray sky...today there is snow- aren't we done with winter yet? Thanks Tom, Chris, and Megan. What a snowy slushy mess today here in Columbus! "Hawthorns are shrubs and scrubby trees with a nasty reputation for being terribly hard to identify." Thanks for that. Now I know it isn't just Jo and I who have a problem with hawthorns. We have at least two (maybe three) different species fairly close together up on our pasture. Nothing seems to eat the berries on one of them. They really are difficult. Most taxa have a worldwide expert- "The" person that you can send a specimen to if you can't nail and I.D. down. As far as I know, all the hawthorn experts have passed away with time, and no one has picked up the torch! They are fascinating to study. Good luck! We have four good-sized Washington hawthorns in our yard and they are one of my favorite trees. They have a beautiful shape, they're covered in white blossoms in the spring (although they STINK), and those red berries are to die for. Ours are pretty well gone now, except on the very lowest branches, but the birds still like perching in the branches. I guess I'll have to heed your advice and go scouring for some color. Surely there is some somewhere! The red here is great! It looks almost warm! Thank you. It is back to gray here in Ohio today, but on this past Saturday, we had an amazing blue sky day! Luckily, I paired this day up with a outing on the Cuyahoga Valley Scenic Railroad. Good luck finding color and warmth! It won't be too long before spring is here.